Effects of Super-oxygenated Water Supplied by Drip Irrigation on Tomato Production. 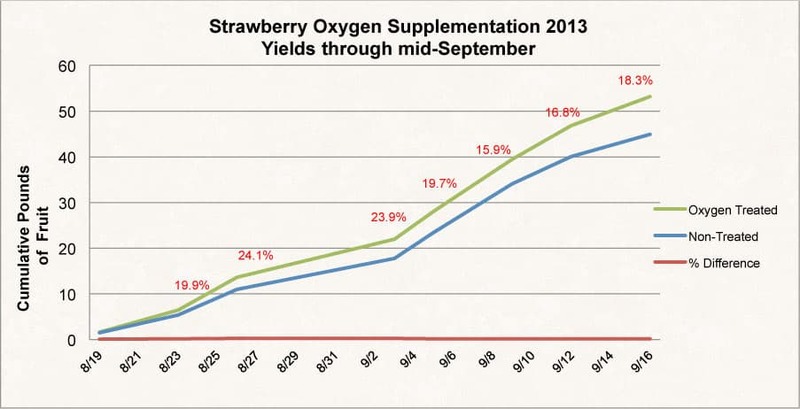 Prior studies have shown increased yield from super-oxygenated water treatments. 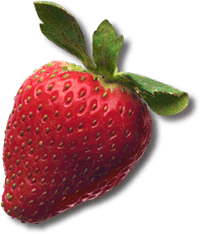 A three-year study on strawberries (Honeoye, a June-bearing variety) found positive effects for berries grown with wool mulch. (S. Poppe) A study of organically-grown tomatoes showed a 16% increase in the number of fruit and a 13% increase in total fruit weight. Peppers grown as part of the same study showed increases of 22% and 32%, respectively. (Dr. A.H. Markhart) Another study of flowering plants showed a 16% increase in shoot growth, a 14% increase in root growth, and plants generally exhibited “more vigorous growth”. (Dr. A.H. Markhart) These studies suggest that super-oxygenated water treatment in the controlled environment of high-tunnels could be beneficial in increasing yields. A high tunnel located at the University of Minnesota North Central Research and Outreach Center in Grand Rapids, Minnesota, was used to test the effects of super-oxygenated water on a crop of tomatoes. The tomatoes used in the trial were a determinate grafted variety. The rootstock was “Maxifort”, which is known for its disease resistance and improved plant vigor. The scion was BHN 589, a variety well-suited for hot conditions and known to produce high yields of large fruit with no cracks. The tunnel, which was oriented north to south, was divided into two blocks (block 1 on the west side and block 2 on the east side) to control for differences in light intensity. Ten plots of raised beds were created in each block. Two lines of drip irrigation tape were installed in the beds at a depth of 4″. Four tomato plants per plot were planted in the tunnel. Half the plots were randomly assigned to receive the super-oxygenated water, and the remaining half received untreated water. Super-oxygenated water was created using an Oxygen Research Group LLC, Minneapolis, Minnesota, “Water Dog” machine. This machine uses an electrolysis procedure to separate water into hydrogen and oxygen. The hydrogen is released, thereby increasing the percentage of oxygen in the water. (2.5 ppm oxygen in untreated water vs. 12 ppm in treated water) A weak 20-10-20 fertilizer solution was incorporated into the drip irrigation water. Tensiometers were used to monitor the soil moisture. During the active growing period, tunnels were supplied with approximately 50 gallons of water in a one hour period several times per week. Watering amounts were increased during hot periods and decreased during cool periods, based on tensiometer readings. Strawberry plants were planted in the tunnels in mid-June. Blossoms were removed from the strawberry plants until mid-July to allow the plants to develop before bearing fruit. Harvest began on August 12th and continued through mid-October. The decrease in day length slowed growth and water-usage after mid-September. 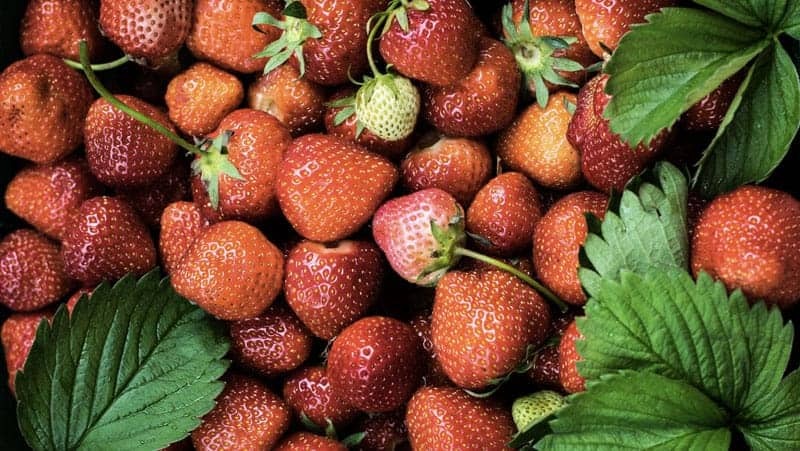 Strawberry yields showed positive gains for those plants treated with the super-oxygenated water over those provided with untreated water. Since growth began to slow after mid-September, yields through that date were evaluated. At that time, super-oxygenated plots showed an 18.3% advantage (confidence level 99%). See table 1. Berry size began to decrease in early September, and growth began to slow near mid-September. The differences between treated yields and untreated yields peaked in mid-September. See figure 1. 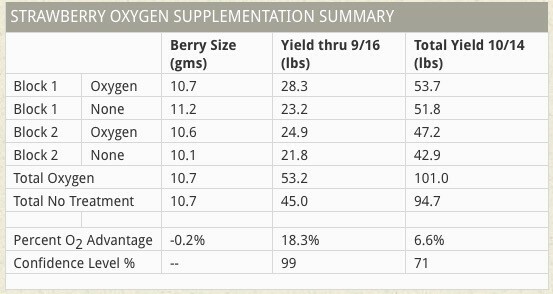 While there was no difference in berry size, the total yield for the super-oxygenated plots was 6.6% greater than the untreated plots (confidence level 71%) when evaluated through mid-October. See figure 2. Overall fruit quality was good, but some mouse damaged occurred as the weather cooled. 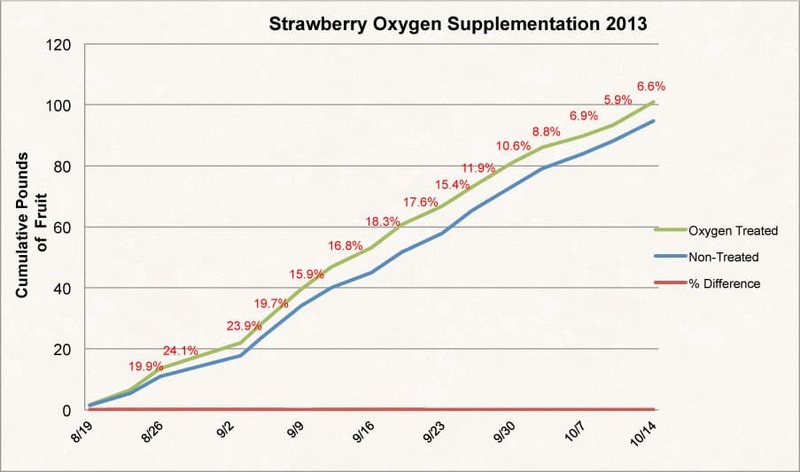 Strawberry crops showed an increase in yield when plants were treated with super-oxygenated water. Cumulative results were positive for super-oxygenated treated plants throughout the growing season, although individual harvests varied. Yields through mid-September for super-oxygenated plots showed a very significant advantage (18.3 % with 99% confidence level) over non-treated plots. Since day-length and heat were decreasing after mid-September, plant growth and yield declined as did the differences between the treated and untreated plots. That the difference between treated and untreated plots narrowed as growth slowed would be expected since less water was being applied to the plants. Irrigation amounts dropped from nearly 50 gallons per day several times per week to less than 25 gallons one time per week as temperatures cooled. One caveat for this study is that the plants were planted in the high tunnels somewhat late in the season, due to cold spring growing conditions in zone 3b. One advantage of growing crops in high-tunnels is the ability to extend the growing season both in the spring and in the fall. These plants were not available for planting until mid-June, while tunnel temperatures usually permit planting in April or May. Mild temperatures in the early fall permitted good growth to continue into mid-September, providing fruit for the late-season market when prices may be higher. Supplementation with super-oxygenated water is a very promising concept and deserves further consideration for high tunnel application. High tunnels are an ideal environment for such experiments, since water can be precisely controlled and rainfall is not an issue. The differences were positive for strawberries, especially during the period of most active growth. Earlier planting to take advantage of the additional heat in the tunnel environment possibly would have resulted in even greater yield differential.